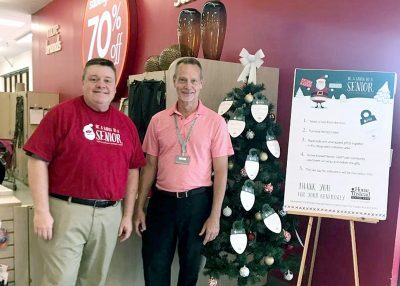 David Scott, co-owner of the Home Instead Senior Care franchise in Sun City Center, and Beall’s Outlet store manager Gary Carlascio to host a Christmas tree filled with paper ornaments in the Ruskin/Sun City Center store. Area residents can take an ornament and buy a gift for a lonely senior through Dec. 18. No one likes to feel forgotten or alone, especially during the holidays. It’s a relatively common experience for seniors who live alone. For the second consecutive year, the local Home Instead Senior Care office wants to help. 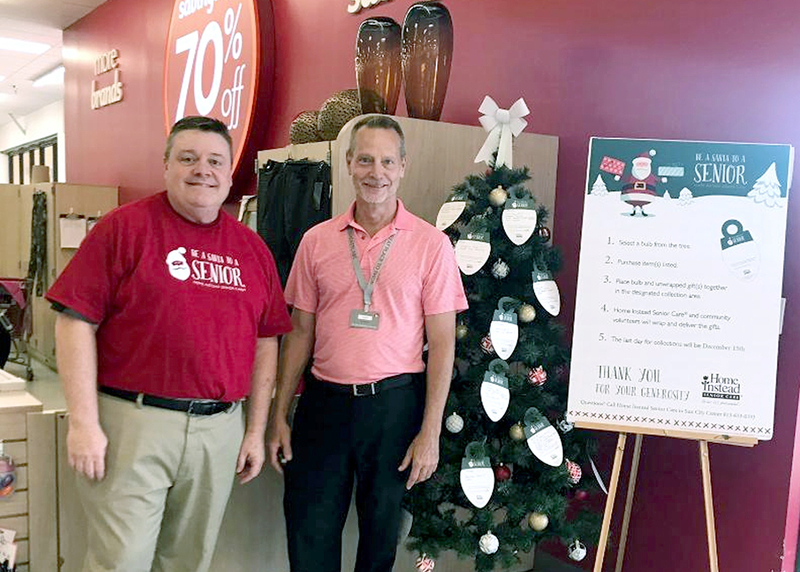 This year, Scott enlisted the help of Beall’s Outlet manager Gary Carlascio to host a Christmas tree filled with paper ornaments in the Ruskin/Sun City Center store. The ornaments include the first names of seniors living alone or in need who were referred to Scott by area organizations serving them. They also list a gift or two these folks requested. So far this year, these organizations include Samaritan Services, the Mary Petro Fund, St. Vincent de Paul Society, Belvedere Commons, Sun Towers and Sun Terrace. Others are welcome to participate, Scott said. Based on last year’s ornaments, most people request simple things, like large-print playing cards, body wash or a pair of socks, a flashlight, perfume or picture frame. 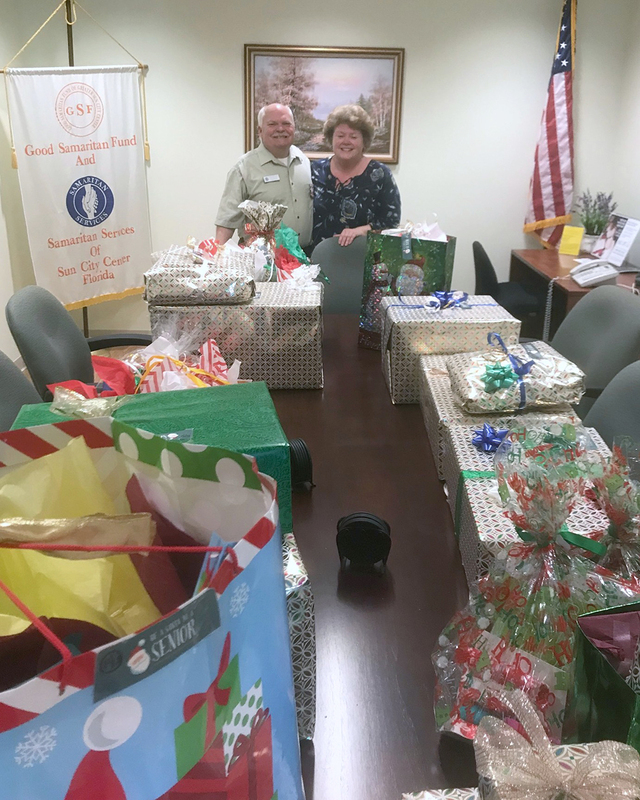 Susan Scott, of Home Instead Senior Care franchise in Sun City Center, and Kirk Warren, Samaritan Services office manager, stand behind a table filled with gifts donated by the community for seniors living alone or in need during last year’s inaugural Be a Santa to a Senior. Occasionally, someone’s wish is to get a Publix or Walgreen’s gift card to purchase food items or over-the-counter medications. Those requests are on ornaments on a Christmas tree in Scott’s Home Instead Senior Care office at 957 E. Del Webb Blvd., Suite 102A in SCC. Residents are asked to pick up an ornament there or at Beall’s, purchase the gift(s) requested and place them, unwrapped, with the ornament in a box next to the tree. Volunteers come in daily to replace taken ornaments with new ones, pick up gifts in the box, and take them to the Home Instead Senior Care office. The last day to select an ornament and buy a gift is Dec. 18. All of the gifts will be wrapped Dec. 20 and delivered to the appropriate organizations or individuals. “Working with the senior community, you see many individuals who experience social isolation,” Scott said. “It’s rewarding to know during the holiday season that you can alleviate their enhanced feelings of isolation by participating in a program like this. Debbie Caneen, director of admissions for the Sun Towers Retirement Community, agrees. If you know someone living in Sun City Center who would benefit from Be a Santa to a Senior, call David Scott at 813-633-0333.